I had a fancy for bangers, had empty pockets, and pork trimmings were cheap, so I made some sausages the other day. It’s one of my favorite hobbies and a nice way to while away a windy winter’s day when one is feeling rather skint. I love the creativity of sausage making, the mechanics of working with my gleaming cast iron meat grinder and yards of wrinkly hog casings, and especially the delicious results. This time I decided to make some Mexican chorizo for an upcoming molotes project (stay tuned), as well as some bangers, a classic sausage from the British Isles that’s laden with bread crumbs and sneered at by many sausage snobs. I love it anyway, remembering it fondly from a couple of trips to England when I was very young. I wouldn’t give up all other sausages for it, but it’s a lovely change of pace once in a while. I planned to eat it with some of its standard accompaniments, a pile of “mash,” as in “bangers and…”, some mushy peas, onion gravy and HP sauce. 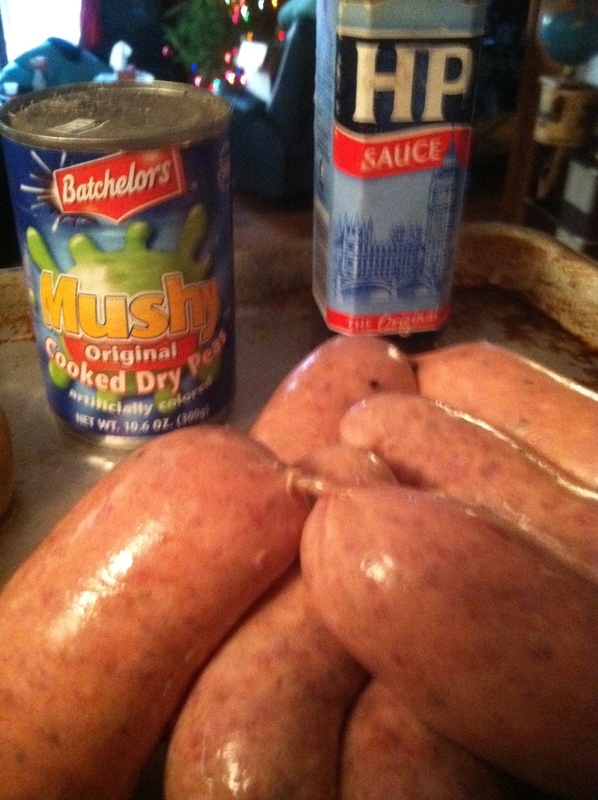 I used this recipe for Oxford Sausages from about.com, substituting some very young ground venison that my ex, the hunter, gave me. The free-range meat is delicate, not gamey-tasting at all, and made a fine stand-in for the less humanely raised veal. Not that it’s “humane” to kill wild animals, and I could never do it, but if one is to eat meat, that from animals who lived happily and free and ate a diet of wild foods rather than hormones and antibiotics, is a better choice, I think. I used Pepperidge Farm Original White for the bready filler. Something called rusk, a type of dry biscuit, is used in commercial bangers, but Peggy of about.com said “white bread,” so that’s what I used. I let the mixture steep in its own spice for a couple days, then made it into sausages, which I browned and poached while I boiled russets for my mash, heated canned mushy peas, and made an onion gravy by sauteing a bit of chopped onion in the drippings, adding flour, cooking and stirring, then adding a bit of chicken stock (beef would have been preferable but I had none handy), Kitchen Bouquet, and grainy Dijon. I added a pinch of salt and pepper and simmered until thick. The rich gravy, tangy HP, and even the pleasant green mushy peas (not mushy at all but firm and flavorful) were all perfect with the potatoes and savory sausages. It may have awoken my genetic memory of ancestry in the old country; it was that satisfying. 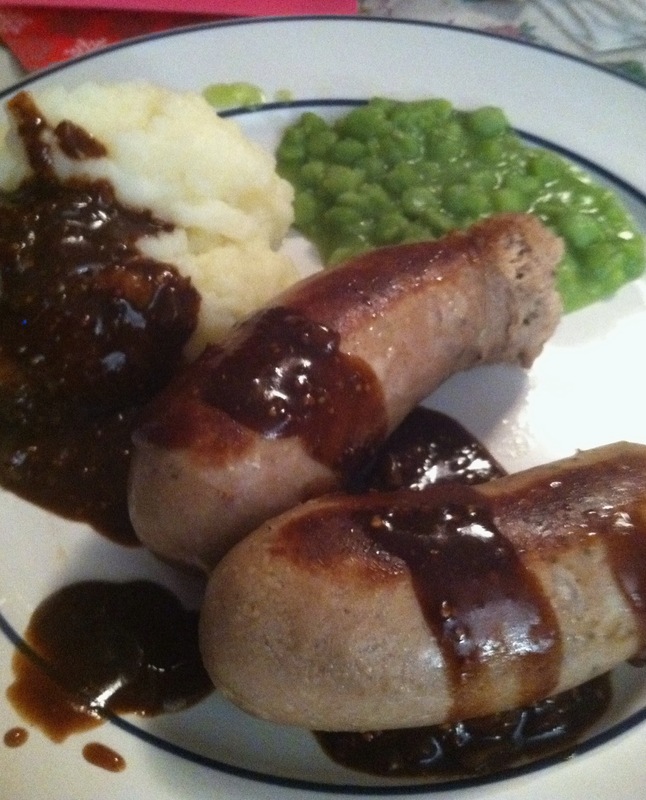 Bangers and Mash is a dish considered Irish as well as English, so perhaps in two months from today, when St. Patrick’s Day rolls around, you may want to remember these bangers and try some of your own. Or don’t wait that long and make some now.